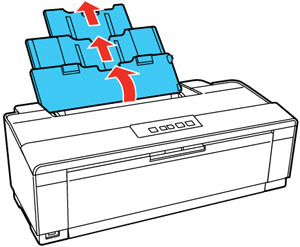 You can print on a variety of paper types and sizes. Open the paper support and pull up the extensions. Open the output tray and pull out the extensions. Slide the edge guide left. 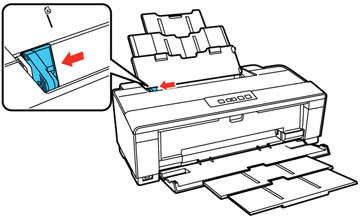 Insert paper, glossy or printable side up and short edge first, against the right side and behind the tab. Then, slide the edge guide against the paper, but not too tightly. If you are inserting a stack of paper, fan the sheets first and tap the stack on a flat surface to even the edges. 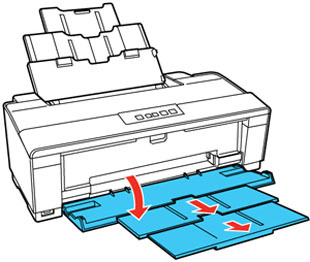 Note: During printing the left edge guide automatically moves 0.12 inch (3 mm) to the left. Do not move it back manually. Load only the recommended number of sheets. 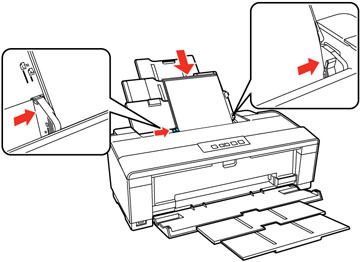 Load paper short edge first, no matter which way your document or photo faces. Load letterhead or pre-printed paper top edge first. Do not load paper past the arrow mark inside the edge guide. Do not load paper with holes punched in it. Check the paper package for any additional loading instructions.